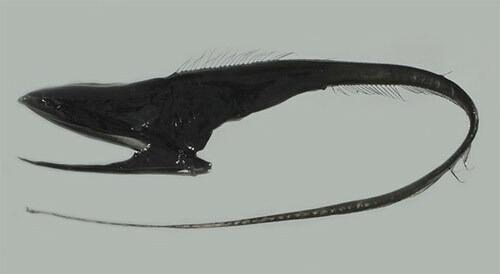 The strange gulper eel (Eurypharynx pelecanoides) is distinguished by its very large mouth and small body. The open mouth is 11 times the volume of the whole eel. This makes it possible to take occasional meals of small or large prey in an environment where food appears only rarely. It is thought to feed rather like a baleen whale, scooping the prey and the surrounding water, then squeezing the water out between its teeth and through its gills. Prey include crustaceans, fish, seaweed and cephalopods (including squid and octopus). It has tiny eyes on the tip of its snout, and a light organ on the tip of its tail, possibly to attract prey. It is most often found at depths between 1,000 and 2,100 metres.